Pick up the CD from one of our shows, from CD Baby, or from us directly at a show. You can also listen on our web player on this site. 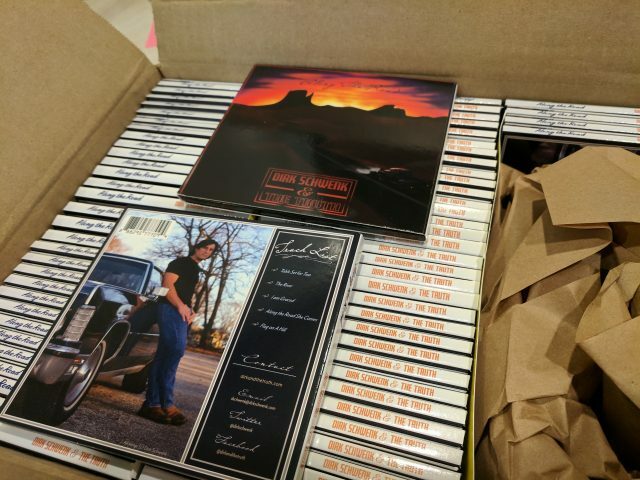 Award winning folk rock, Americana singer/songwriter Dirk Schwenk (along with his band, The Truth) has delivered his latest album Along The Road. Along The Road is packed with five tracks. Each worthy of radio airplay and playlist placements. I really mean that. These songs will immediately grab you and will refuse to let go until the very end. All five tunes featured on this project are well produced, well crafted, infectiously memorable tracks featuring the highest caliber of musicianship and production talent. Powerful melodies, unforgettable hooks, beautiful guitar tones, soaring organs, heartfelt harmonies, passionate singing and much more can be found packed into this fine display of songwriting talent. Along The Road is guaranteed to pack a sonic punch that will have you coming back again and again for another listen. Dirk knows how to write songs that hit you hard and stick with you long after they’ve ended. If he hasn’t infected radio yet, I trust it will happen soon. The first song sets the story for this album. It’s easy listening, rock, and country all mixed together. My favorite song from the Along the Road is “The River”. This a nice song, you feel the country music vibe flowing from this song with the banjo playing throughout. This song will have you wanting to hang out, fish, or relax by the riverside (or other body of water).